I cannot begin to tell you how much I am in love with this cupcake! I cannot get over how good this turned out LOL let’s not forget to mention, how easy and Flippin delicious it is! Oh annnnnd super high in protein and low in carbs !!! 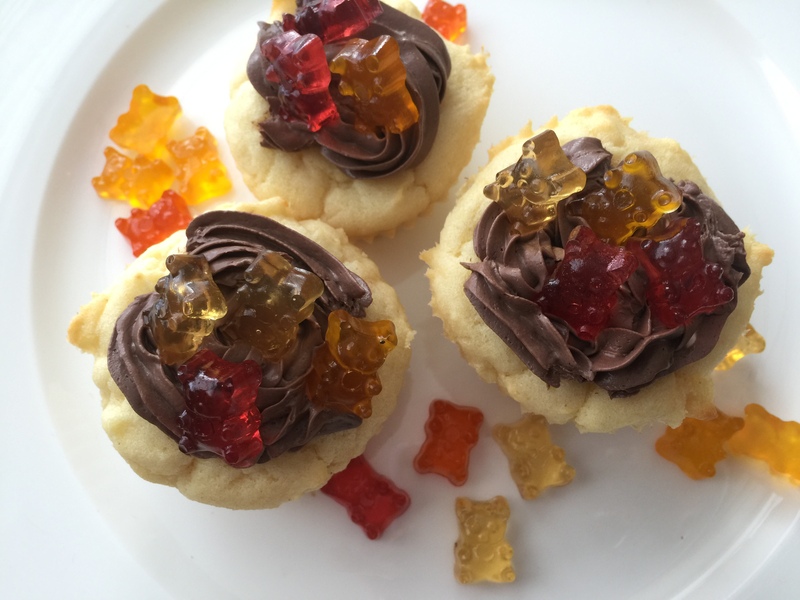 I recently teamed up with smart sweets! If you have not heard of this amazing company I definitely recommend googling them up! Local Vancouver company that is changing the world of candy! 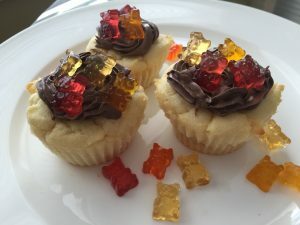 My cupcakes are topped with a healthy version of gummy bears…… Yes that’s right gummy bears! On their own,they are so delicious and very addicting! But the bonus of these guys is they are high in fiber, no artificial colors or flavors , free from sugar alcohols, corn fiber, peanut and tree nut free! So I decided why not top this epic cupcake with more tasty goodness! This was my first day back in my home kitchen from being on holidays and man did it ever feel good to get back into it! OK so here’s what you need to make this ! In large mixing bowl, use electric mixer and blend cooked sweet potato & Crisco. Slowly add in remainder of dry ingredients. Mixture will not be liquidy it should be a thicker consistency. Scoop mixture into individual cupcake tins. Make sure you line your tins with a tinfoil cupcake wrapper. I prefer A tinfoil cupcake wrapper because it doesn’t stick like paper wrappers do. Preheat oven to 350 and bake for 25 minutes . Cupcake should be a light golden brown on top, use toothpick to make sure their dents in the middle. Let cool for 30 minutes before frosting. In separate mixing bowl use electric mixer to blend cream cheese & slowly add in Almond milk and chocolate Stevia. Place in fridge until cupcakes are cool and ready for frosting . Let cupcakes for at least Half an hour prior to frosting. Top with as many gummy bears as you like!